A map of USPS preferred names associated with ZIP codes in the Washington region Image by the author. Newcomers to the region are often surprised that much of Maryland and Virginia is unincorporated, meaning local governance is handled solely by the county instead of by town or city government. Since names are usually defined by these town and governments, having so many unincorporated areas makes defining the names of these places somewhat ambiguous. As I suggested in June, the names of census-designated places was a good substitute for the names of cities and towns in unincorporated suburbia. However, since most people do not regularly look at census data — but nearly everyone interacts with the post office — the names the US Postal Service associates with ZIP codes are more commonly used. However, that can be a problem for a number of reasons. Using ZIP codes to refer to geographic locations is complicated by the fact that ZIP codes do not always correspond to areas on a map. Some ZIP codes are used only for PO boxes at a particular post office — for example, the city of Greenbelt, MD is mostly in the 20770 ZIP code, but PO boxes at its post office all have 20768 ZIP codes. Other times ZIP codes are used to route mail to naval ships and to military bases overseas. In addition, government agencies, companies, and other institutions that receive large volumes of mail are often given their own ZIP code which may correspond to a single building, despite being located in an area with a different ZIP code. Federal agencies in the Washington region usually have ZIP codes that start with 202, 203, 204, 205 and addresses in “Washington,” even when they are physically located in Maryland or Virginia. However, those ZIP codes that are defined in terms of geographic regions have some advantages. Nearly every location in the US is in a ZIP code, and ZIP codes are generally well-known to residents of an area. They are also often — though not always — geographically coherent, since mail delivery in a given ZIP code is usually served by a single post office. On the other hand, ZIP code place names can lead to confusion. First of all, ZIP codes do not generally correspond to city and town boundaries, so having a ZIP code associated with a city is no guarantee that an address is actually located in that city. Second of all, ZIP codes actually have multiple names associated with them. For every ZIP code, the post office defines one preferred name, which databases and mailing systems often automatically default to. They may also define multiple acceptable names, which can also be used for any address within the ZIP code. 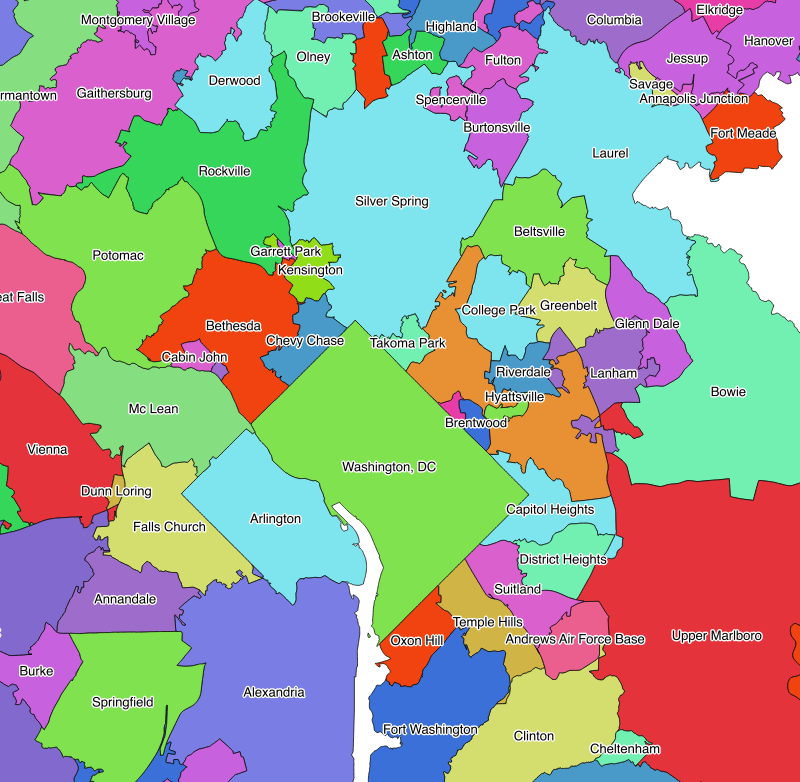 With this in mind, let's take a look at the preferred place names associated with ZIP codes in the Washington region. 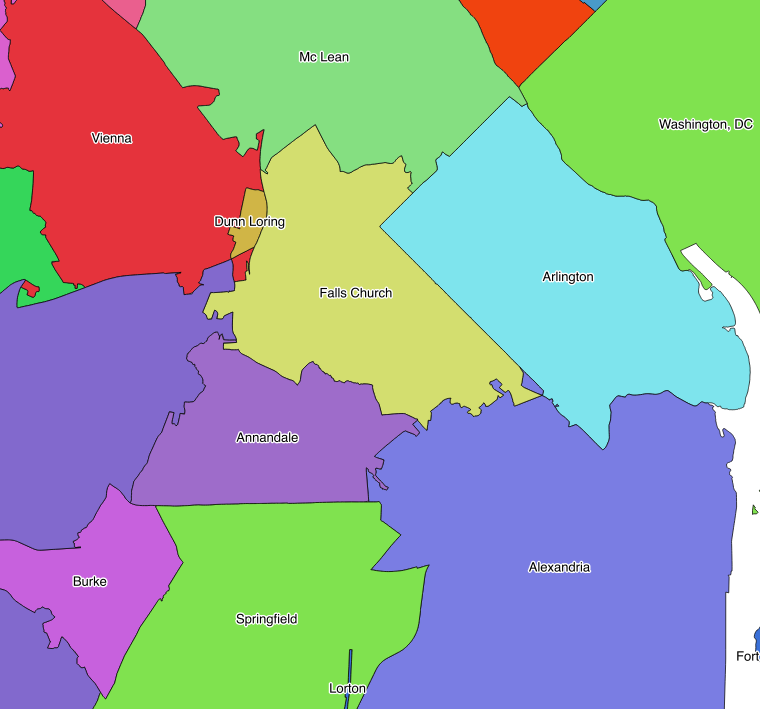 Montgomery County has a reputation for having relatively few place names, and this is reflected in the ZIP code preferred names for much of the county. 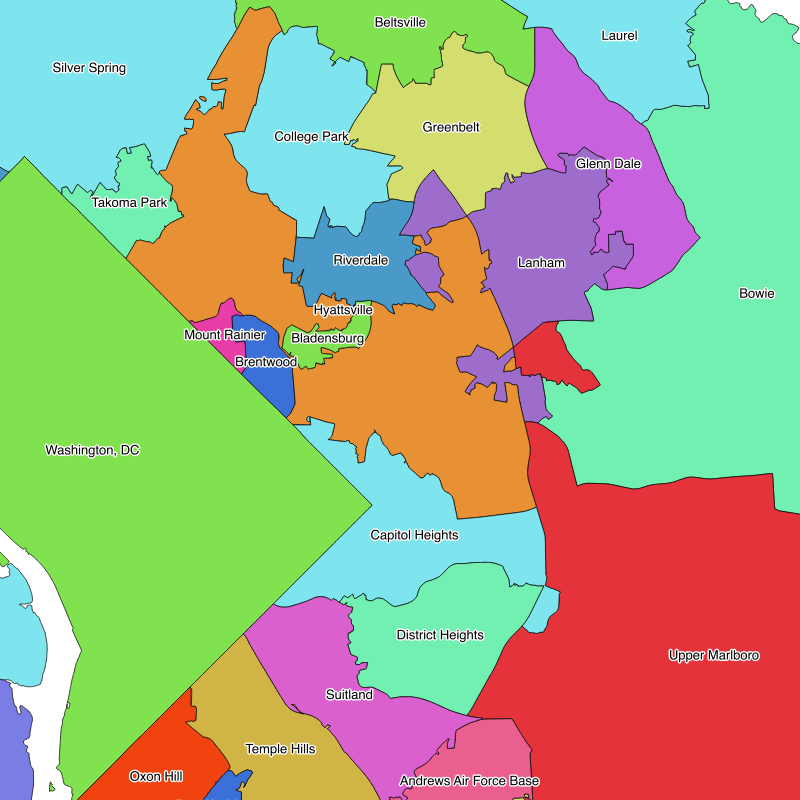 Nearly all of the county east of Rock Creek and south of the Inter-County Connector is identified as Silver Spring, while the Wisconsin Avenue/Rockville Pike corridor is split between Bethesda (which like, Silver Spring, is an unincorporated place) and Rockville (which is a large municipality, but much smaller than the boundaries of what the Post Office considers to be Rockville). A map of USPS preferred names associated with ZIP codes in Montgomery County. North of Rockville, the name Gaithersburg — which is also a sizable incorporated city — is also the preferred name for a rather large section of unincorporated land. However, there are a number of medium-sized preferred names in Montgomery County. Along the DC border — and, unsurprisingly, in areas that were early streetcar suburbs — Takoma Park (which includes a sizable incorporated city) and Chevy Chase (a name shared by a number of small municipalities on the Connecticut Avenue corridor) are the preferred names for significant swaths of land. The northern rural tier of Montgomery County, despite being much less densely populated than “Silver Spring,” “Bethesda,” and “Rockville,” is divided up into relatively small areas with their own preferred names, including Olney, Sandy Spring, Ashton, Spencerville, and Burtonsville . 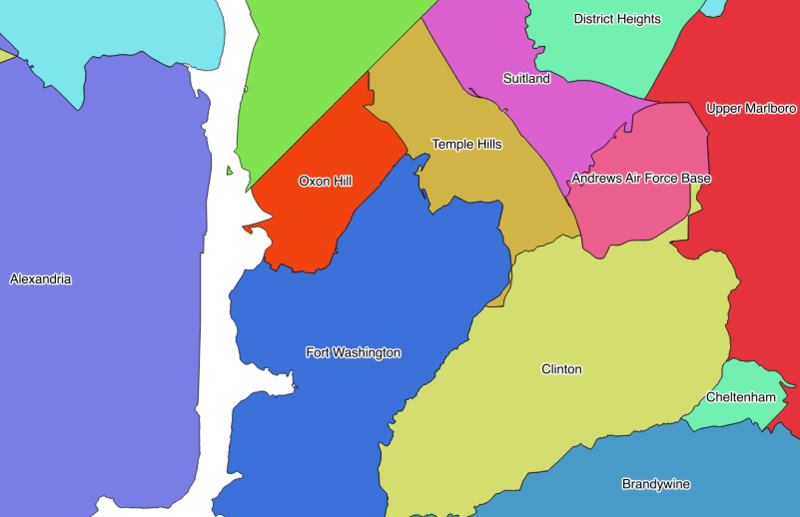 Meanwhile, there are a couple of tiny municipalities in Montgomery County — Glen Echo, Cabin John, and Garrett Park — that have their own ZIP codes approximately coterminous with the municipalities with their own preferred names. The early streetcar suburbs of Mount Rainier and Brentwood and the colonial port town of Bladensburg (which later also became a streetcar suburb) have their own ZIP code preferred names, and the larger cities of College Park and Riverdale Park do as well. However, much of northern Prince George's County inside the Beltway is known to the Post Office as Hyattsville. It's not surprising that Hyattsville is the preferred name for ZIP codes far beyond the borders of the actual City of Hyattsville. 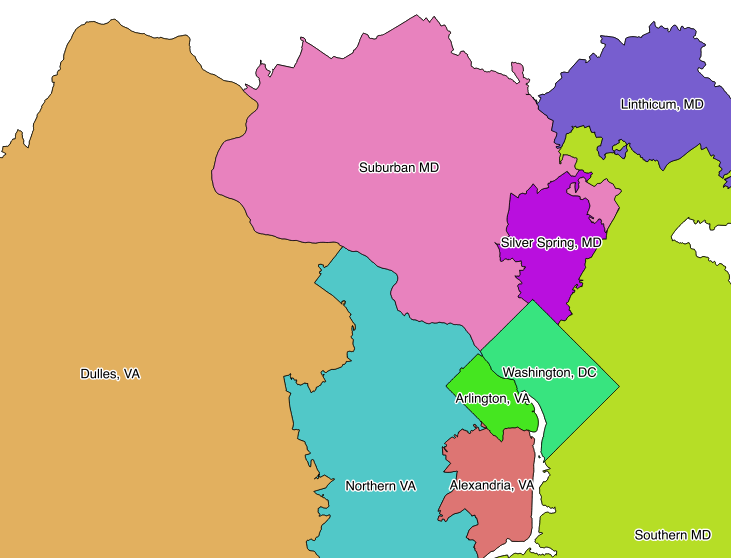 What is rather strange is that there are actually two regions with the preferred name Hyattsville, separated by Riverdale, Bladensburg, and Brentwood ZIP codes. The western of these two regions that the Post Office considers Hyattsville contains the City of Hyattsville and unincorporated areas to its west and north. The eastern one, though, contains none of Hyattsville, and is made up of two ZIP codes (20784 and 20785) that include the incorporated municipalities of Landover Hills and Cheverly and New Carrollton. Furthermore, while Landover Hills and Cheverly are relatively small, New Carrollton has two-thirds the population of Hyattsville. The existence of the eastern lobe of “Hyattsville” may date back to events when New Carrollton was incorporated in 1953, a decade before ZIP codes were introduced. The city was incorporated with the name Carrollton. However, the Post Office already recognized a locality in Carroll County as Carrollton, Maryland, and was unwilling to allow the same name to be used for two localities in the same state. Until the city changed its name to New Carrollton in 1966, mail to New Carrollton had to be addressed to Hyattsville to avoid being sent to Carroll County. A map of USPS preferred names associated with ZIP codes in northern Prince George's County. Outside the Beltway, much of northern Prince George's County has the ZIP code preferred name of Bowie. Although the City of Bowie is the largest municipality in the county both in terms of population and geographic extent, it only makes up the eastern half of this large area. The eastern half of it consists of new unincorporated developments being built in what was relatively recently farmland. Older outside-the-Beltway developments along the Penn Line and Annapolis Road have their own preferred names of Lanham, Glendale, and Greenbelt (which extends as a ZIP code significantly to the east of the city of Greenbelt itself). A map of USPS preferred names associated with ZIP codes in southern Prince George's County. Southern Prince George's County remained rural longer than the areas along US-1 and the Camden Line and, except for at the far eastern tip of the District, doesn't contain streetcar suburbs. It also has far fewer incorporated municipalities than the northern portion of the county. Inside the Beltway, this area of the county is divided into a few moderately-sized preferred names, all roughly radial from the District border. From Capitol Heights along Central Avenue south, these are District Heights, Suitland (roughly along Pennsylvania Avenue), Temple Hills (roughly along Branch Avenue), and Oxon Hill (along Indian Head Hwy). Outside the Beltway, the name of the county seat, Upper Marlboro (actually a tiny town of half a square mile with a population of about six hundred), is used for the large swath of land east of the District and south of Central Avenue that has been home to significant new development over the course of the past two decades. Meanwhile, the far southern tier of the county (which still contains significant farmland) is broken up into a number of ZIP code preferred names while, across the Potomac to the west, the much denser US-1 corridor all has the preferred name “Alexandria,” even though most of it is actually unincorporated Fairfax County. Unlike the Maryland suburbs of DC, Northern Virginia really only has one small area that gets its own preferred name: Dunn Loring. This is likely because the area has very few incorporated municipalities compared to Montgomery and Prince George's Counties. A map of USPS preferred names associated with ZIP codes in Northern Virginia. The only ZIP code preferred name in Northern Virginia that seems to be nearly coterminus with a municipality or county is Arlington, which is the preferred name for ZIP codes that almost exactly match the borders of Arlington County. The City of Alexandria, on the other hand, has the preferred name Alexandria for its ZIP codes, but it shares this preferred name with much of southeastern Fairfax County along the US-1 corridor. The preferred name Falls Church is used for a broad swath of territory west of Arlington County, much larger than the City of Falls Church, and Vienna is used as a preferred name for an area much larger than the Town of Vienna. 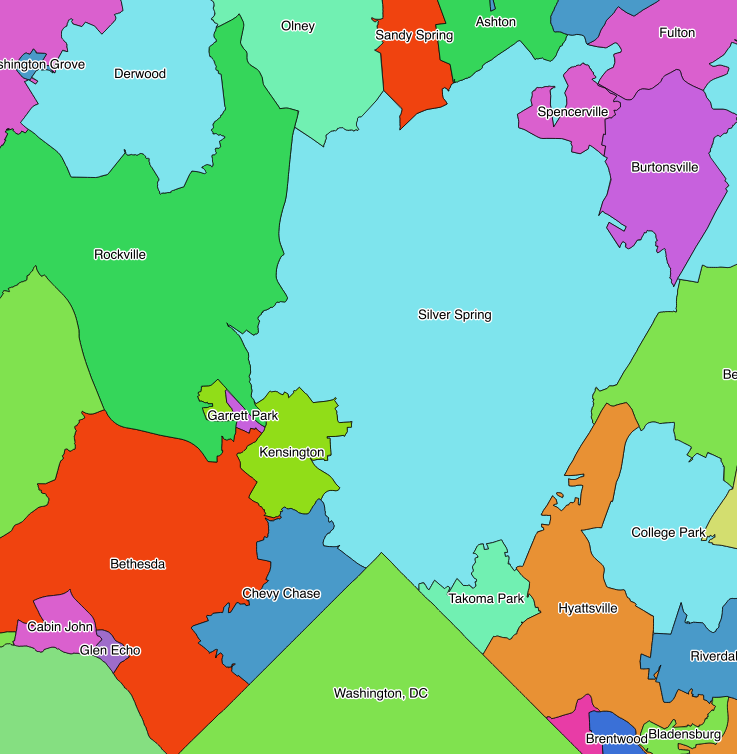 Interestingly, nowhere in Fairfax County or Fairfax City has Fairfax as its preferred name. While individual ZIP codes can and often do have their own preferred names assigned to them, these names do not always appear on postmarks. Outgoing mail is processed at “sectional center facilities” that are assigned one or more ZIP code prefixes (the first three digits of a ZIP code), and the same postmark is generally used for all ZIP codes with the same prefix. A map of the place names (used on postmarks of outgoing mail) associated with three-digit ZIP code prefixes in the Washington region. In the Washington region, mail from the District is postmarked as from Washington, DC, mail from Arlington County is postmarked as from Arlington, VA, and mail from ZIP codes with the preferred name Alexandria — including much of southern Fairfax County — is postmarked as from Alexandria, VA. The rest of Northern Virginia is split into Northern Virginia postmarks for areas closer to the District and Dulles, VA postmarks for the rest of Northern Virginia. In Maryland, all of Prince George's, Charles, Calvert and St. Mary's Counties, and the southern portion of Howard County, use Southern Maryland postmarks, while Montgomery County is split into Silver Spring postmarks for ZIP codes with 209 prefixes and Suburban Maryland postmarks for ZIP codes with 208 prefixes.